There is nothing unusual about snow in late March, as most of us know. 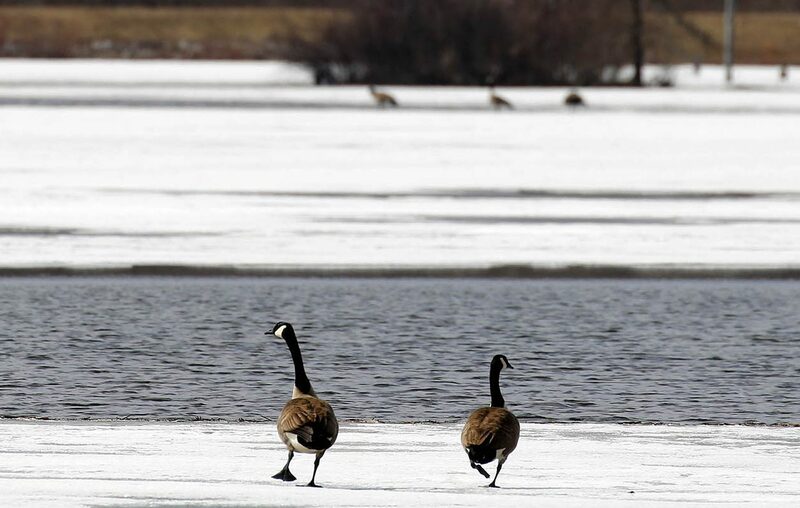 March 22 brought winter storm warnings to much of interior eastern New York and northern New England for heavy snow and strong winds, as well as some nuisance snow to higher terrain in WNY. It may be depressing, but there is nothing freakish about it. Here is the range for average last measurable snow dates, compiled by diligent Alaska State Climatologist Brian Brettschneider. Averages, being only smoothed extremes, don’t tell the story for any given year. Brettschneider also compiled the record latest measurable snowfall date range. Many of us remember the nearly 8 inches of slushy snow that fell on the Mother's Day weekend of 1989. This year, I’m fairly confident we’ll end up coming closer to average rather than at the extreme end of the range for the last measurable snow. Currently, as a deep nor’easter pulls away from New England over the weekend, the upper-air pattern reflects the colder-than-average temperatures at the start of the weekend. The big mountainous ridge of high pressure that extends into Alaska, combined with the deep area of low pressure in the northeast, forces the polar air to the north to tumble down into our part of the country. By Sunday, the upper-air ensemble still looks pretty cold, but the vortex has actually retreated just far enough north for temps to jump to the upper 40s to near 50, though there will be a stiff breeze off the lake. Spring will have trouble gaining much traction next week, with some more ups and downs. The first down occurs Monday, when this modeled surface map shows a cold high on the far left delivering a more northerly flow into Western New York again, and dropping daytime highs back into the 30s. A few stray flakes can’t be ruled out. The cold holds through Tuesday night, with readings edging back into the 40s on Wednesday and warmer on Thursday, with some probable 50s. It’s still not looking like steady-state warmth by the end of next week, but statistically, that’s to be expected. The “downs” will be somewhat less down, especially as the sun angle rises higher in the sky. I think I can now dare say it’s safe to remove plows and winter tires by Sunday this weekend. The long range CFSv2 model is especially emphatic on this warming in the east. I think it’s overdone, frankly, but it’s worth seeing. Looking at the entire month of April, the CFSv2 is quite optimistic — though, again, it may be overdone. 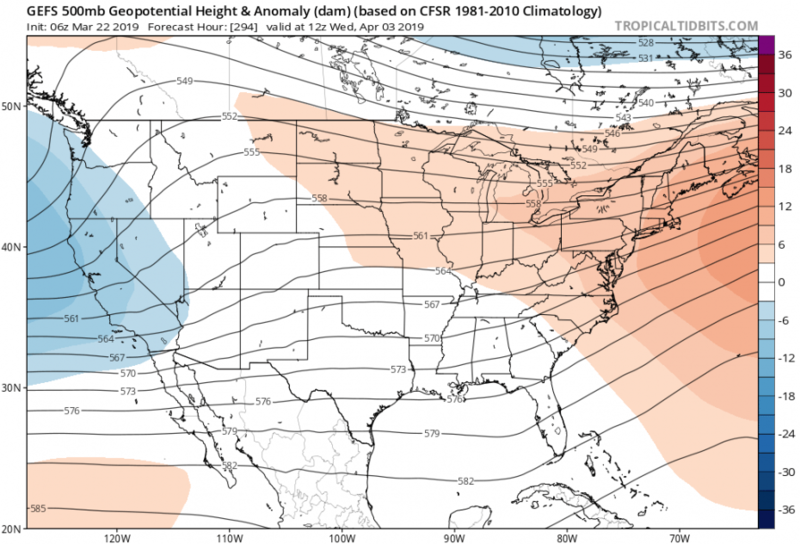 When you add human meteorologists to the mix, there is still plenty of optimism from the National Weather Service Climate Prediction Center/CPC for three and four weeks out. And CPC’s probabilities on temperatures running above, below or near average aren’t too shabby for April, either. This April outlook was just issued on the 21st. I still have to add the caveat of greater uncertainty as we get into the first week of April. I’m seeing signs of more instability in that west-to-east flow pattern, and that can allow brief incursions of chilly air during the first part of the month. If you search your memories, there’s nothing unusual about chilly outbreaks in early April in the Great Lakes or the northeast. I even remember some Yankees-Red Sox games being snowed out. As of March 21, Buffalo is running 3.1 degrees below average for the month, so, yes, it’s been cold and you’re not imagining it. With all of my caveats, I am at least confident when we get to late April, our temperature departure will have no minus sign attached to it. A plus sign will be in order.